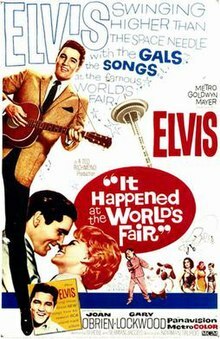 It Happened at the World's Fair is a 1963 American musical film starring Elvis Presley as a cropdusting pilot. It was filmed in Seattle, Washington, site of the Century 21 Exposition, the 1962 World's Fair. The governor of Washington at the time, Albert Rosellini, suggested the setting to Metro-Goldwyn-Mayer executives. The film made $2.25 million at the box office. Pilot Mike Edwards finds himself in a dilemma, his partner and friend Danny, gambles away the money Mike had set aside to pay their debts. Since they lost their money and a $1,200 debt, the local sheriff takes possession of their plane, Bessie, a Boeing-Stearman Model 75 cropduster. If they cannot come up with the money in twelve days, Bessie will be auctioned off to the highest bidder. Mike and Danny become reluctant hitchhikers, looking for a lift to anywhere. They are picked up by apple farmer Walter Ling and his niece Sue-Lin. They end up in Seattle, Washington, location of the 1962 World's Fair. When the uncle is called away on business, Danny persuades Mike to take Sue-Lin to tour the local World's Fair. It is during a visit to the doctor at the fair that Mike falls for Diane Warren, an attractive but stubborn nurse who resists Mike's advances. He gives a quarter to a boy (a very young Kurt Russell) who kicks him in the shin, so that he can be treated by her. Diane's supervisor then convinces her to give Mike a ride back to his apartment, convinced his leg is injured. Mike and Diane dine at the top of the fair's Space Needle. However, he also courts Dorothy Johnson. Complications then arise. Walter inexplicably fails to come back the next day to get Sue-Lin, leaving her with Mike. Sue-Lin feigns illness so that nurse Diane will come to their apartment and examine her and see Mike again. When Diane discovers that Mike has no kinship to Sue-Lin, she wants to inform the Welfare Board so that Sue-Lin can be removed from Mike and Danny's apartment. There is a mysterious nightfall plane delivery for Mike's and Danny's friend Vince, who is smuggling valuable furs. The film ends with Mike and Diane in love. The Seattle Center, including the Seattle Center Monorail and the Space Needle, serve as backdrops for several scenes in the film. Security officers pursue Presley and the girl through the fountains at what is now the Pacific Science Center. The hitchhiking scene with Elvis and Gary Lockwood was filmed near Camarillo, California, as were some of the flying scenes. The entire hitchhiking scene to the point where they are both picked up by Kam Tong and Vicky Tiu Cayetano in the truck is easily recognizable as 5th Street near Pleasant Valley Road on the South side of Camarillo. While The Elvis Encyclopedia believes that the Wilburton Trestle was shown in the movie, further evidence points to a different location. It is actually a trestle over the White River between Enumclaw and Buckley, now demolished. The view in the movie was taken at the intersection of Mud Mountain Road and Highway 410, looking southeasterly. Mount Rainier is visible in the background, which isn't seen at that angle from the Wilburton Trestle. The Wilburton Trestle is actually bigger than the White River Trestle, at six sections high. The trestle pictured in the movie is only four sections high at the road crossing. Eugene Archer of The New York Times wrote, "Elvis Presley's budding dramatic talents have been neatly nipped in the Seattle story, which emerges as a dismal parody of the Metro-Goldwyn-Mayer musicals of old. Burdened with a dozen tuneless songs and a plot requiring him to play guardian to a mercilessly cute Chinese waif, the crooner merely swivels ingenuously through a morass of clichés." Variety wrote that "this is apt to be tedious going for all but the most confirmed of Presley's young admirers. The 10-count-'em-10 tunes he sings may be cause for rejoicing among his more ardent followers but, stacked up proportionately against the skinny story in between, it seems at least three too many ... so many warbling interruptions upset the tempo of the yarn and prevent plot and picture from gathering momentum." John L. Scott of the Los Angeles Times wrote that "it must be said that unless you're a Presley fan, the 10 songs he offers while plinking a guitar or ukulele can grow tedious, while the frivolous backgrounding story is turned on and off between tunes." The film was released to DVD by Warner Home Video on August 7, 2007 as a Region 1 Widescreen DVD. It marked Kurt Russell's film debut. Vicky Tiu, sister of entertainer Ginny, later grew up to be the first lady of Hawaii when she married Governor Benjamin J. Cayetano. ^ "Top Rental Features of 1963", Variety, 8 January 1964 p. 71. Please note figures are rentals as opposed to total gross. ^ Adam Victor. The Elvis Encyclopedia. Overlook, 2008. ^ Key to the City's profile of Buckley Archived 2011-09-08 at the Wayback Machine The history blurb on this page was written before the trestle was demolished. ^ Archer, Eugene (May 30, 1963). "Presley and Reeves in Double Bill at Neighborhood Theaters". The New York Times: 15. ^ "It Happened At The World's Fair". Variety: 16. April 3, 1963. ^ Scott, John L. (April 6, 1963). "Songathon Stars Elvis". Los Angeles Times: Part III p. 5. Guralnick, Peter, and Ernst Jorgensen (1999). Elvis Day by Day: The Definitive Record of His Life and Music. Ballantine. ISBN 0-345-42089-6. Kirchberg, Connie, and Marc Hendrickx (1999). Elvis Presley, Richard Nixon, and the American Dream. Jefferson, NC: McFarland and Company. ISBN 0-7864-0716-6. Lisanti, Tom (2000). Fantasy Femmes of 60's Cinema: Interviews with 20 Actresses from Biker, Beach, and Elvis Movies. McFarland and Company. ISBN 0-7864-0868-5. Marcus, Greil (1980). "Rock Films," The Rolling Stone Illustrated History of Rock & Roll, second edition. Random House. ISBN 0-394-73938-8. Presley, Priscilla (1985). Elvis and Me. New York: G.P. Putnam's Sons. ISBN 0-399-12984-7. Thomson, David (1998). A Biographical Dictionary of Film (3d ed.). Knopf. ISBN 0-679-75564-0. "What Happened At The World’s Fair: Elvis And The Future In Seattle" by Jim Demetre at The Monarch Review, October 18, 2012.
Review by Bill Treadway at DVD Verdict, August 12, 2004.
Review by Mark Zimmer at digitallyOBSESSED!, August 4, 2004. This page was last edited on 23 December 2018, at 04:13 (UTC).